A visual tour of the Greatest Show on Earth! P.T. Barnum was a well-known showman recognized for his engaging hoaxes. He was so successful at fooling the masses he decided to showcase his collection in a large museum. In 1841 Barnum, purchased Scudder’s American Museum and renamed the building “Barnum’s American Museum.” In 1842, Barnum’s museum became the talk of the town with exhibits, such as “General Tom Thumb” and the Fiji Mermaid, which displayed the mummified body of something that resembled a grossly deformed mermaid or half mammal-half fish creation. The famous Siamese twins Chang and Eng were introduced to the world. 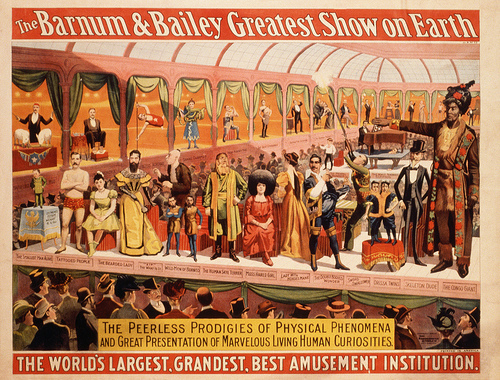 Many of Barnum’s “freaks” would become circus acts. General Tom Thumb would become a favorite Ring Master. As much as we might shutter to think of housing disabled people and those who look different, this was honest work for them. Many remained loyal to Barnum as he offered them shelter, fame and money. Not one to let disaster stand in the way of success, Barnum decided to take his museum on the road. With his famous name and financial backing, the “P.T Barnum’s Grand Traveling Museum, Menagerie, Caravan & Hippodrome” was born. His closest competition at the time, James Bailey, would later become an ally. 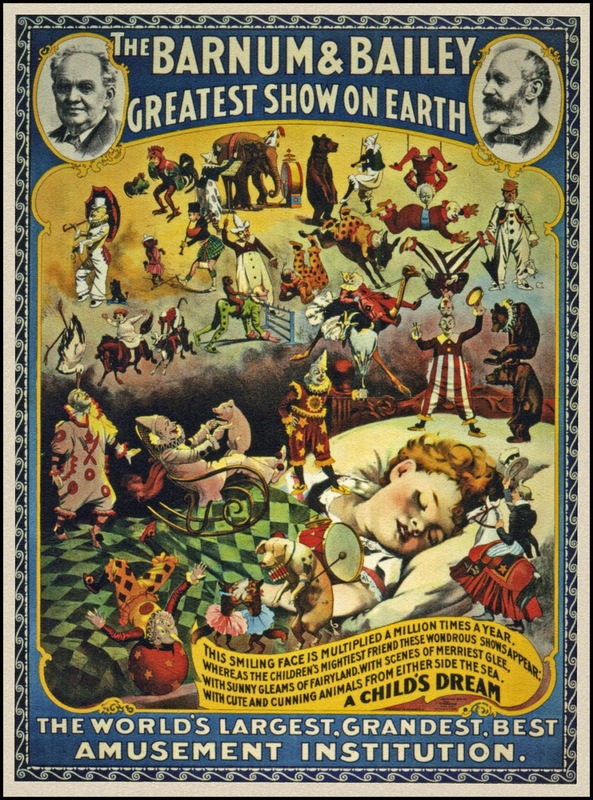 In 1872, Barnum would coin the phrase, “The Greatest Show on Earth,” as his traveling circus of freaks toured the world, undergoing a series of name changes and billings in the process. 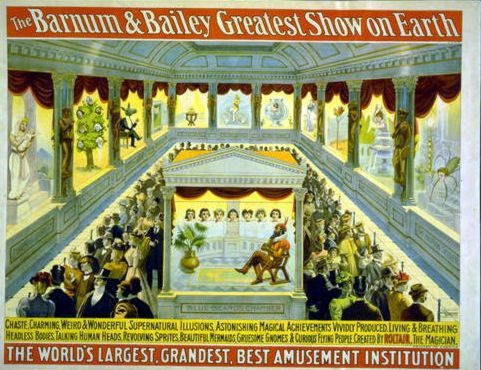 In 1881 Barnum, who was losing money, joined forces with James Bailey and James L. Hutchinson. The original name, “P.T. Barnum’s Greatest Show On Earth, And The Great London Circus, Sanger’s Royal British Menagerie and The Grand International Allied Shows United” was shortened to “Barnum & London Circus”. A series of splits ensued resulting in several more name changes. The circus became known as “Barnum & Bailey Greatest Show on Earth” then “Barnum & Bailey Circus”. The last name change came about when professional acts and animal tricks started to replace the aging “freaks”. When P.T. 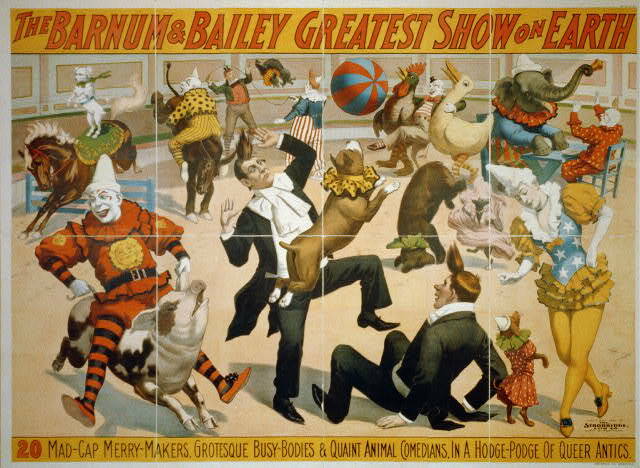 Barnum passed away in 1891, Bailey purchased the circus from his widow. He successfully toured the eastern part of the United States until he transported the circus to Europe where in 1897 he began touring the continent. 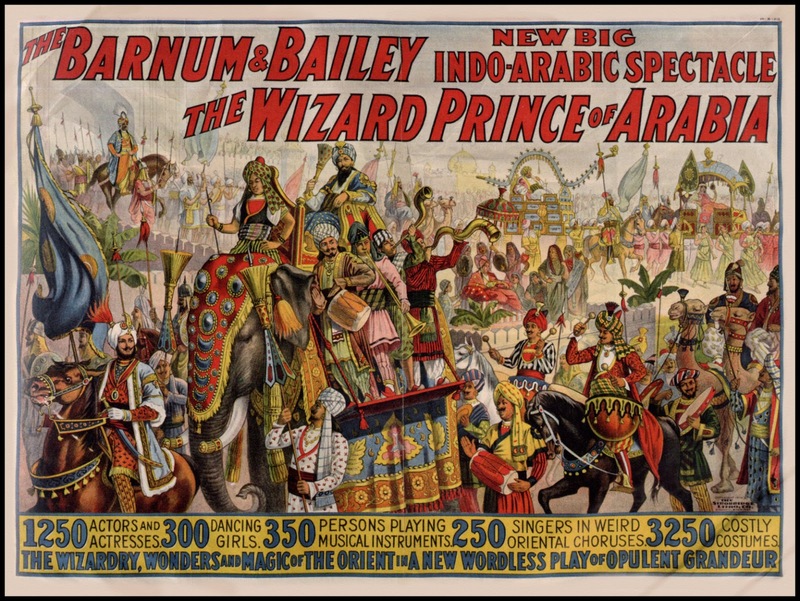 When Bailey returned to the U.S. in 1902 to find that Ringling Brothers had established a reputation in the east. The new rivalry forced Bailey to tour the Rockies for the first time during 1905. 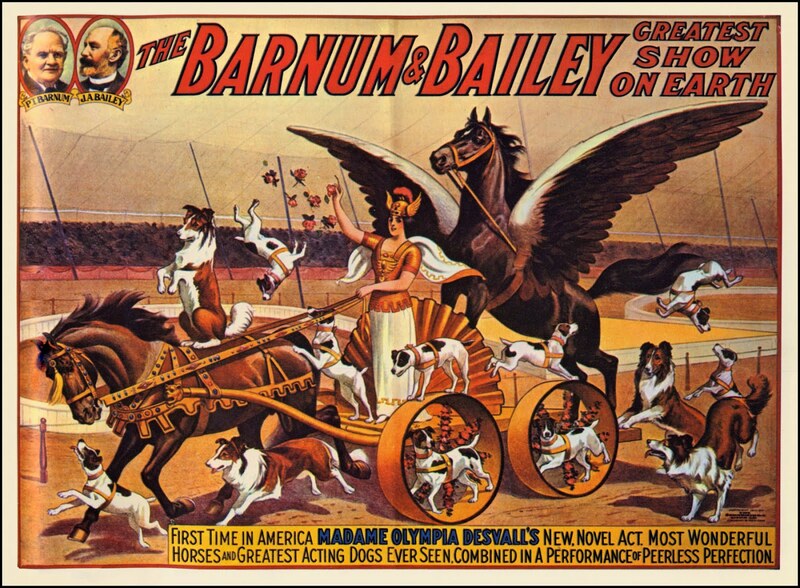 The next year, Bailey passed away and the Barnum’s much-loved circus was sold to Ringling Brothers in 1907 for the sum of $400,000. Not much is known about the first professional acts, it would take the Ringling Brothers to legitimize the circus with ads talking about the performers as real people, not oddities. But we can imagine the mystery and fantasy of the Greatest Show on Earth by the colorful posters history has left us. So grab your peanuts and come with me on a visual tour of the circus! Click on any picture for a better view. The posters are almost as exciting as the real thing! Great insights into how shows like this significantly differed from the more bland circus shows I remember from the mid-20C. And though I haven’t been to the circus in many a year it’s instructive to note from reviews and notices that circuses, with the phasing out of many animal acts, have returned to the concept of themes and narratives within the show itself, rather like “The Wizard Prince of Arabia” must have been.